Forget the roses and chocolates, celebrate the day of love this Valentine's Day with some of the most romantic world records. Guinness World Records, the global authority on record breaking has pulled together a list of the best heart-melting, head-over-heels titles to get your heart fluttering. Pucker up buttercup because this Guinness World Records title consisted of kisses made on sticky notes that were displayed on a board to form a big giant kiss. The board measured 18m² and consisted of 13,316 kisses and was achieved by NIVEA Brasil, at Pinheiros Station, São Paulo, Brazil, on June 12, 2012. If your partner has the biggest sweet tooth, this Guinness World Records title will certainly have them smiling from ear to ear. Produced by Thorntons and Russell Beck Studios, the largest box of chocolates weighed 1.689kg and was 16ft 6inch long, 11ft 2inch wide and 3ft 0.5inch deep. Taking weddings to the next level, Ewa Staronska and Pawel Bukowski from Poland held the largest underwater wedding with 303 divers attending the wedding. The ceremony was organised by Orka Group Ltd (Poland) at the Koparki Diving Base, Jaworzno, Poland, on August 27, 2011. For the ultimate public display of affection, people from Province of Bergamo, Italy, joined in a giant embrace to achieve the most people hugging on 3 July 2016. 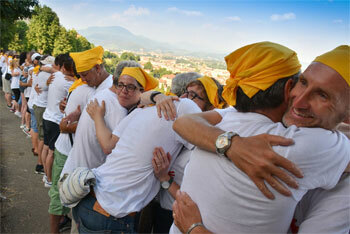 It included a total of 11,460 participants (5,730 couples) and created a 5km line along the wall of Bergamo. Can't wait to get married? Rev. Darrell Best of Shelbyville, Illinois has the answer for you! In 2010 Rev. Best converted his 1940s fire truck into a wedding chapel on wheels. The venue allows couples to tie the knot while they're on the road and is capable of reaching speeds of 99km/h. Rev. Best who has married over 40 couples in the vehicle, says that people love it because "it allows them to get married in any environment they want"."